yes, but after true discernment, the wordly life is not different from the spiritual life, for it is us, in the end, who are present in both worlds, the spiritual and the world as well! 'I' am there also, 'I' am here too. So in the end, we will have to end up facing this 'I' and cope with it, which is nothing but the mind, which manifests itself due to boredom. Boredom is the most troublesome defect, a sadhaka experiences in his intense sadhana. Why is it, that, all our anubhuti (being-experience) of the truth is always temporary? Why is it, that, each time, when we sit for enquiry on the self, we are unable to continue the focus after some time? After some time, we get tired, or bored and we are naturally forced to get up and do something else to relieve ourselves! The fundamental problem with our sadhana is our boredom. Unfortunately, the reality, the truth, the Self is really not an exciting subject after a certain level of discernment for our minds to dwell in the subject, because, the mind eventually realises that, the Self is nothing new, it is nothing other than itself, there is nothing, anymore exciting in knowing what is already known, and then it is bored and looks for newer and other fresh experiences to dwell into. We usually, watch television, call some acquintance over the phone and chit chat, or go out for a walk or a round somewhere, aimlessly, sometimes, boredome culminates into hunger, want of new taste, so, one eats, or one picks up some books and reads, maybe spiritual or aspiritual. If all of these don't interest the mind, the mind tries to seek physical pleasures, enjoyments, wine, women and lavish money spendings or look for new Gurus and exciting sadhanas to keep itself occupied in some experiential transcendental bliss. If it has no activities to do, it feels sleepy and sleeps out of boredom. Depression is a fine line here. When the mind is bored, and is also equally bored to, not do any activities, or do any thing new, such a mind falls into deep depression. Depression is basically the inability of the mind to remain occupied in something. It is at a loss for all ideas to keep itself engaged. It is neither able to keep itself occupied in activity nor is able to discern further the enquiry into the Self, it is unable to remain as Self. The whole problem of Samsara is the weakness of the mind to cope with itself about the fact that it itself is the personification of boredom. Mind itself is Bored of itself, as it intuitively knows about itself but not experientially. It intuitively is aware that it is nothing but just a bunch of information and without information, it is nothing and this is its true nature, which is the pure Self. The mind feeds on information and more precicely, newer information because, it is not content in having the same old information, which it already has. How to cope with boredom? If we are able to win the boredom, which itself is the mind, we are at peace. We have to be with that boredom. Remain with boredom, just sit with it, be with that pain of boredom. Do not do any activity out of boredom. Be with boredom and bore the boredome itself. Remaining with boredom is like being an erasor, so long we remain still with the boredom, the information is being erased. the sankalpa to raise above and do something is pulled down to source by not allowing the boredom to take over you. The Mind receives its light from you to act. Without your will and permission, the mind does not act. Therefore, deny any permission to the mind to act. If any important duty is there, just allow the mind to do that and remain. This is Tapas. This is true Sadhana. Sometimes, if this sitting is really tough, one may excercise Self Enquiry. But it is even better to remain still without even thinking. The mind, the personification of boredom would tease and taunt you to think about various things and tease you like the damsels from the Sky. Do not give any room to it. Remain with awareness and not allowing the thinking. Remain Still with boredome, till it erases every other information and itself in the end. You will remain even after that. Not allowing the mind to think is erasing the information and itself. Just observe. Be a passive observer of your mind, Do not act on whims and fancies of the mind. Just be. Ignore the mind. The mind is like the Ghost which resorts to silly tricks of fooling you by emotions and taking the guise of importance etc... do not give any room for anycomplacency and be still. Sit with boredome. Put the boredom as though you lock it in a cage and do not open the door. Do not open this door at any cost, the mind will play tricks to fool you. If duty calls, you go and finish just the duty and come back here. You dont even have to allow the mind to perform the duty. You can! Patience is this. This is patience, bearing the mind - boredom. enduring boredom and not allowing it to emerge. This is the non emergence of 'I' non emergence of ego, non emergence of boredom. The easiest and quickest way to fight boredom is just being with it, sitting by it without doing a thing. Even chanting shlokams and japam are only secondary. It is only when the being with boredom becomes tough, we resort to chanting the names of God, instead of allowing the mind to exert its activities. It is basically to supress the activity of the mind. But even better than it is just being simply quiet with patience and enduring the boredome mind without doing anything. while in the beginning, it is ok to chant shlokas, do japam, etc... eventually, culminate yourself in remaining simply by the side of the boredom mind. don't even do this. Then the mind will beg, and cry, oh God, ok I will not do other things, but at least please allow me to chant shlokas (it is here in this state, where many Bhaktas have sung so many songs on the inspiration of you (God, Self) who is a mute witness. The boredom cries, please, I beg of you! Even then at that advanced state, remain quiet, don't get trapped in the plays of the mind - boredom. Don't even allow the chanting of Shlokas to the mind, while it is ok to allow the mind to sing and chant shlokas for only some time, while it is unbearable, do not allow that freedom for ever. Would you give amrit of immortality to the Asuras? the Rakshasas? Don't give. Recollect the Mohini, avatar of Vishnu. Another reason to be proud of India. Researchers are now finding out the facts that Hindu Civilisation's existence even from 32000 years upto 1 lac years back. The Guru, God and Atma are identical. is to say that God is spirit, that this spirit is immanent everywhere and that the Self must be realised, which is the same as realising God. Yes, At least some soul even thought about making a film about Sri Adi Shankaracharya, Sri Ramanujacharya, Sri Ramanujacharya. The teachings of Bhagavan Sri Ramana Maharshi / Re: History of the mantra "Om namo Bhagavete Sri Ramanaya"
I counted the letters in this new mantra, and was very happy to find it also contained twelve letters; I told this all to Sri Bhagavan, and He gave the mantra His approval. 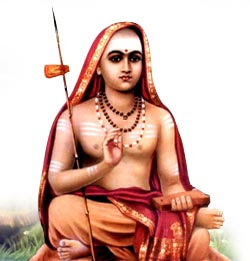 Advanced practisers (sadhaks) and thinkers may laugh at this and say: â€œWhy do you need a mantra while the Ocean of Bliss is there to be immersed into directly?â€� I confess that in this I was trying to conform to the traditional method of practice (upasana) which forms one of the main elements in bhakti (devotion). Bhagavan has revealed His true nature as the All-Witness; yet there is the explicit injunction that Advaita must be only in the attitude and never be interpreted in outer action. This is how the mantra first came out. The teachings of Bhagavan Sri Ramana Maharshi / Re: What is lust? Bhagavan did not even give us lessons on restraint too, rather he took even our ownership of our body too! To even, fall trap to Lust, first, we must have strong Dehaatma Buddhi - Body Consciousness. But Bhagavan repeatedly said, we are not the body. It does not matter if we are able to see it as yet! Bhagavan says so, it must be true therefore. Who has lust then? What is Lust then? Let that entity (body) which is capable of having lust ponder? Why should we (Self) bother? Therefore, To think, I am body, itself is lust! Bhagavan has pulled us all so close to him, that we devotees of Bhagavan need not even bother about lust! Where has the Bhagavan given us Principle? Like Muruganar lamented, Our Guru has even gobbled up even the Principle unlike other Guru's who leave the principle(Feeling of 'I', 'My', 'Mine') with devotees and take interest 'Effort'. No need to bother of Lust and all, Just hold on to 'I' that alone is required! not pleased about anything or displeased about anything. The true form [nature] of God [Self] cannot be understood except by the mind which stands firmly still in nishta [Self-abidance or samadhi]. Therefore, without allowing the mind either to wander as a vagabond [i.e. to undergo waking and dream sakala] or to fall into laya [i.e. to fall into sleep kevala] due to tiredness, train the mind to be conscious and still on one target [Self]. yes Subramanian Sir, really a very hard task it is! Like a prisoner who has lived in a prison for all these years, say 80% of his life and when he is finally released due to his good conduct, the freedom is like a prison now not knowing what to do! Freedom is really not easy! and how many can understand this! And what we call our duty, our responsibility to our family, society is actually very less, now, when I see! we have plenty of time to spare, really! Under the sway of maya, we are engrossed in so much work and occupation, of which 99% is for ones own self gratification and when that sway is broken, it is a tremendous energy to curtail! it is the dance of Shiva Thandavam! Therefore, enquiry is in the end not different from a mantra. a Mantra, usually, a formula, a name of Lord; the repeating of which involves, careful conscious attention coupled with assimilating the essence of the mantra, what it conveys and the reflection of the same constantly by repetition & contemplation! don't have any distinctions such as this is mantra and that is enquiry. Whatever it is that you do, do it with the spirit of pure Bhakti and Faith. What matters, if it is a Mantra or Enquiry or whether it is ones native language or something else? Yes, to make a nice tea, we need to know the ingredients and the quantity that we need to mix together. But then when you drink the tea, why bother about the ingredients and the formulae? Just enjoy the taste. The teachings of Bhagavan Sri Ramana Maharshi / Re: What is Neo-Advaita? Personally, it is just a term used by the orthodox to refer to the modern seekers! Every soul out there is a seeker according to me. Be it, the scientists or spiritualists, just the ways are different! I believe, neo advaitins stress more on knowing the ends more than the means - to put it very simply! Especially, deep spiritual aspirants, are usually caught up unaware, on how to pass time and specially, deep spiritual seekers somehow end up having so much free time at our disposal and we don't know what to do. I'd like to hear from you, friends!